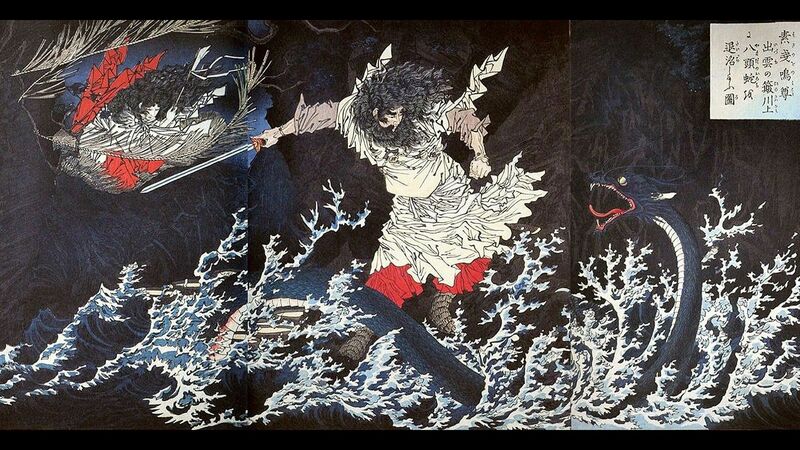 Susanoo is the Japanese god of storms and the sea. He was also the ruler of the underworld, named Yomi. He and his two siblings were all born when Izanagi (a divine deity) washed his face. Susanoo was born when he cleaned out his nose in particular. He once got into a very violent fight which his sister, Amaterasu, where he destroyed her rice fields and threw a skinned horse at her. He also killed one of her attendants. These actions got him banished from heaven. He was sent down to Earth, where he decided to turn a new leaf. He spend a lot of his time helping out an elderly couple who lost eight of their daughters to an evil serpent. Susanoo helped them get revenge by killing the serpent and cutting it into tiny pieces. In the process he discovered a powerful sword buried within the serpents tail.